Today while I was scanning through the newspaper, something strikes me and I broke out in boisterous laughter. I cannot help and I cannot stop. Well, this is because of a news report from an Australian writer about the rudeness of Singaporean and about ethics on MRT Train. I had no complaint when I am referred to as a ‘chin chin’ by Australian, meaning small eye, yellow skin Chinese. First of all KUDOS to the guy with a good sense of humor. The MRT in Singapore has nothing by the name of Tuen Mun Station, and when I read the reply that Mong Kok Station is one station before Tanah Merah, my chuckle was even louder ( I am still laughing while typing this). I wonder whether we all Chinese looks alike to Westerners and Australian. Probably we are all ‘chin chin’ and maybe even got all the countries mixed up. Is Singapore and Hong Kong alike? Geographically we are not at the same location, therefore Tuen Mun and Tanah Merah are ways....ways apart and no connections at all. It is so easy to pull spider webs over the eyes of ignorant, but than before a reporter reports, don’t she needs to get all her facts right? 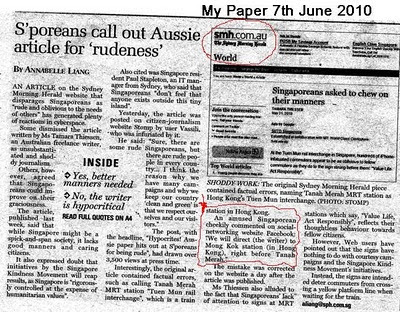 I agree Singaporean can be rude but there are rude people everywhere. Are Australian exception? Do you expect all culture are the same and behave the same way? Blast the people who invented hand phones, make it so easy to be connected and obsession in connecting from voice to everything multi-media. Wait for the World Cup Football to start, it will even be worst. Singapore now is made up of more foreigners. 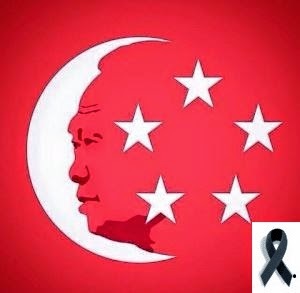 We have given so many countries the rights to come here and we have a flux of Chinese from Mainland China whose behaviors even we Singaporean cannot take it. They came here prostituting themselves with the pretext that they are here for school. You just have to walk around Geylang and those that drives around there swear under their breath. Their couldn’t careless attitude and that the roads belongs to them, test your patience and driving skills. The way they talk and behave… I wonder BUT we have to be nice, that’s what the government wants us to do, accept them into our society since they were given citizenship. There goes our reputations as well. The next lots of people are from India. As this group of people are more workers, Little India will see these people crossing the roads by ‘dashing’ here and there. I was told by a friend that is why they are called ‘Blangadash’. However these are nice people and I admired them for hard work. Some of the boys work extra at night by washing cars at multi-storey carpark. We have a few boys that took care of the flats around our area by sweeping the place, washing the walkway and they always said “good morning, madam”. Not for the Chinese. Singapore of course is an affluent country. Thanks to the government we are well taken care off until we forget how to be polite. From the sales girls in the shops, to even Singapore girls…what’s wrong with us? The worst are the drivers on the roads…I sometime wonder is the Traffic Police around. See the way people drive, they are blind to filtering lights, they never give way and they are oblivious to the facts that you need a parking space while they sit and chitchat…even in eating place. Well after so many years or hard work, our lion toy Singa is dead. I do not know what it implicates – means we are so good manners that we don’t need Singa anymore; or it is pointless to have a Singa because it never works, or Singa makes way for the lion mascot for YOG. Whatever! 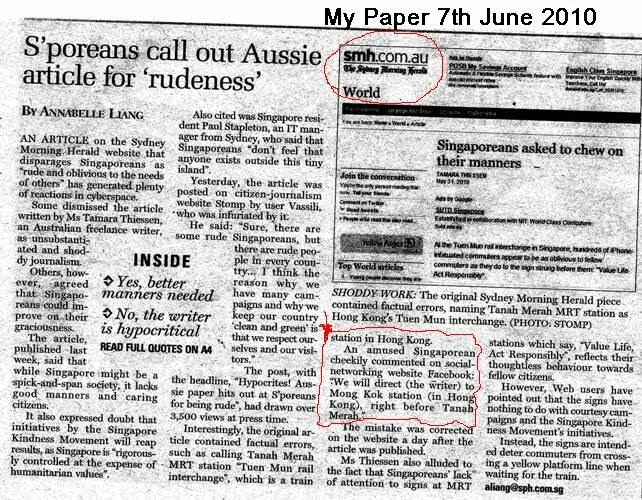 Thank you Australian for criticizing us “Singaporean”. I will not be too defensive about such issue. Will it makes us better or it will be gone with the wind is left to be seen. Don’t worry we will still visit Australia, although my last visit, one of my boy friend nearly got strips down to his brief…talking about rudeness. When we asked is he a suspect, they said it is random. Ha.a.a.a.a….. Sorry, from now on anything not relevant to the subject will not be published. Thank you for your interest in my blog. Spams will not be entertained. Walau...long time nvr hear tis proverb liao.